Lightbrary or Cathedral crystals are comprised of a main point surrounded by smaller points, some of which merge into the main point. If you can imagine a sand castle, that’s what these crystals look like. The surrounding points may not be whole (as in crystals attached side-by-side), but instead are actually merged into the main crystal. I haven’t seen a lot of these Lightbraries (with the points surrounding the main crystal) in Arkansas crystals; they are rare. I have seen more of them that are partial (a main point with two or three merged points surrounding it). There is a different energy to the main or central point of Lightbraries. Cathedral or Lightbrary crystals are extremely powerful Lightworkers and are full of wisdom. They transmit very high vibration and can be used to raise your vibrational frequency. It is said the smaller points contain information from the Akashic records, I am told (by my crystal Guide, Venus) that they work more like portals to information rather than “storage” facilities. Arkansas Crystal Point Cathedral or Lightbrary Quartz Crystal Packaged with a business-card-sized printed description. Crystal sizes vary, depending on the configuration and are hand-selected for you at the time of your order. Image = example of TYPE crystal described. Physical description: These crystals are comprised of a main point surrounded by smaller points, some of which merge into the main point. If you can imagine a sand castle, that’s what these crystals look like. The surrounding points may not be whole (as in crystals attached side-by-side), but instead are actually merged into the main crystal. I haven’t seen a lot of these Lightbraries (with the points surrounding the main crystal) in Arkansas crystals; they are rare. I have seen more of them that are partial (a main point with two or three merged points surrounding it). There are merged points that are not necessarily Lightbraries. There is a different energy to the main or central point of Lightbraries. 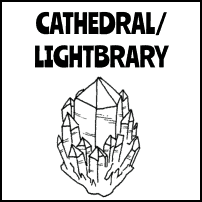 Metaphysical description: Cathedral or Lightbraries are extremely powerful Lightworkers and are full of wisdom. They transmit very high vibration and can be used to raise your vibrational frequency. 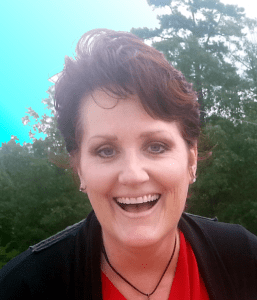 It is said the smaller points contain information from the Akashic records, I am told (by my crystal Guide, Venus) that they work more like portals to information rather than "storage" facilities. 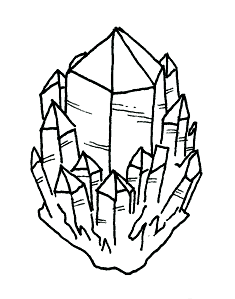 THE IMAGE SHOWN IS AN EXAMPLE OF A CATHEDRAL or LIGHTBRARY CRYSTAL. YOU WILL RECEIVE A SIMILAR CRYSTAL, BUT NOT THE CRYSTAL PICTURED. *The size of these crystals will vary. I will send the most representative example of the type of configuration ordered, so if a crystal is small, but an excellent example of the particular configuration, I will send that crystal. If it is particularly small, I may send two in one bag (say 1/2 inch or so)… I aim for a size range from 1 to 2 inches long, 1/2 to 3/4 inch diameter. 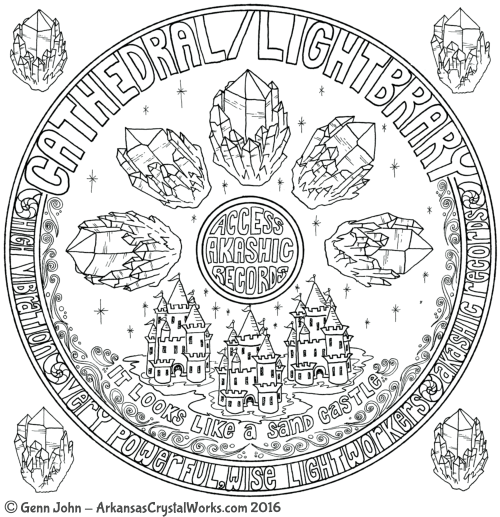 Your Cathedral or Lightbrary crystal will come with a business-card-sized printed description of the characteristics and special qualities of the crystal within. Crystal sizes may vary greatly in size as I am selecting for the shape, not the size. I have packaged it with the description card to help you learn the identifying characteristics and uses of this special configuration. This crystal is sent as a representative sample of a Cathedral or Lightbrary crystal. It isn’t necessarily sent for its size, and sometimes may be Empathic (chipped, dinged or damaged), if it is an excellent representation of this type (for example, a very good Manifestation point in an Empathic chunk, or an excellent Record Keeper on a partial point). These crystals vary greatly in size, but generally speaking they range approximately the size of a large thumb to a golf ball. This is an approximation, though.